I’m very excited to be joining My Favorite Things Sketch Challenges as a Guest Designer for January 2016. I’ll be sharing 4 cards over the next 4 weeks based on the sketches provided, sharing my first project today. Its been awhile since I made a project base on a sketch, I miss that a lot. A good sketch is always fun to work with, it makes it very easy to make a card or any project really. I have to say it was fun and exciting to play with new goodies from MFT, double that considering most of them are Valentine’s Day products and I had a blast making Valentine’s Day cards! 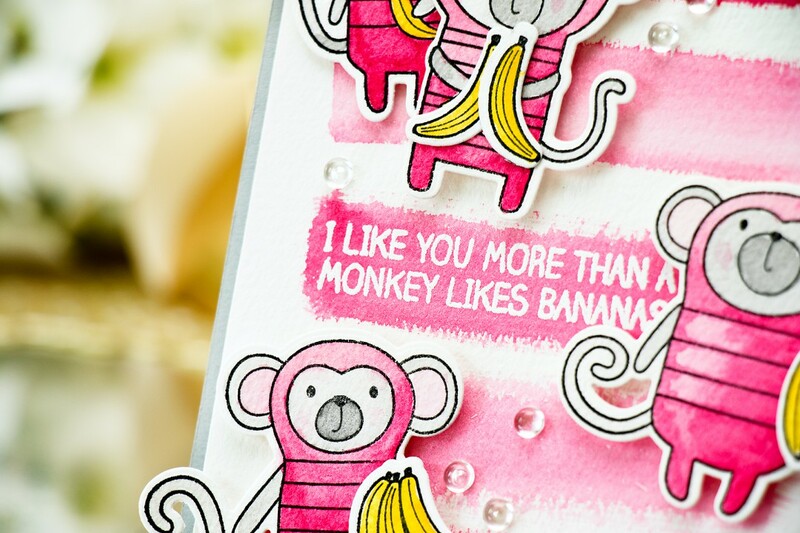 Today I’m sharing a Monkey Valentine’s project – I like you more than a monkey likes bananas. 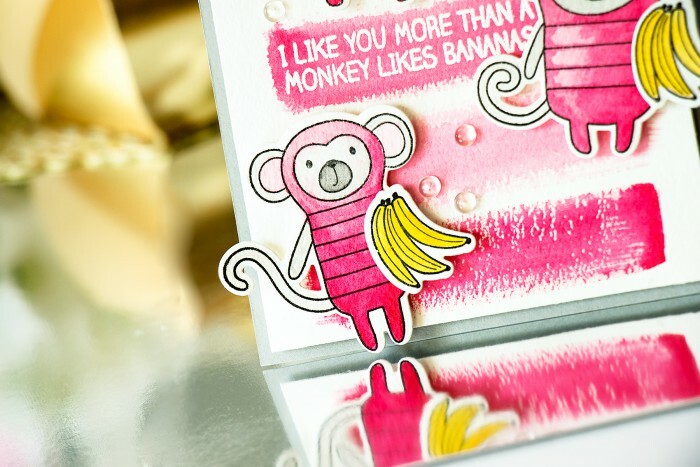 I used Cheeky Monkey stamp set and Die-namics to create these adorable animals on my card. I used my VersaFine Onyx Black ink and stamped images onto Arches cold press watercolor paper, cut out using matching dies and colored using my watercolors. The background was created by drawing stripes using a large flat brush and watercolors, I used the same Arches watercolor paper for the background as I used for the monkeys. Finally I heat embossed a sentiment in white embossing powder, foam mounted my watercolor background onto light grey card base, foam mounted my monkeys and added a few clear dots. Yay for guest designing with us! 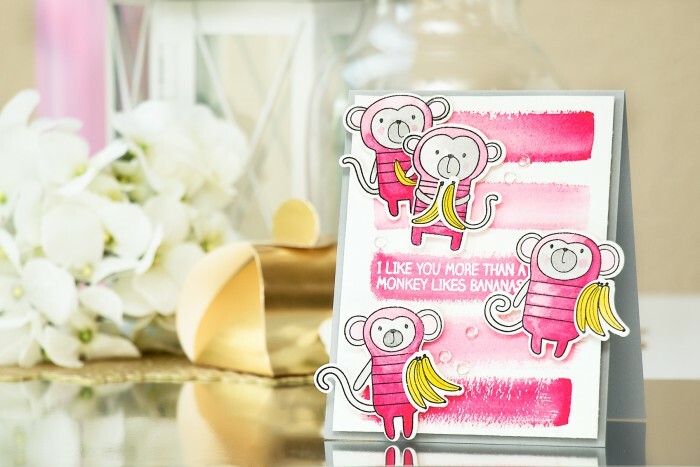 LOVE your take on the sketch and gotta love those pink monkeys!! yay indeed 🙂 thank you, Donna! 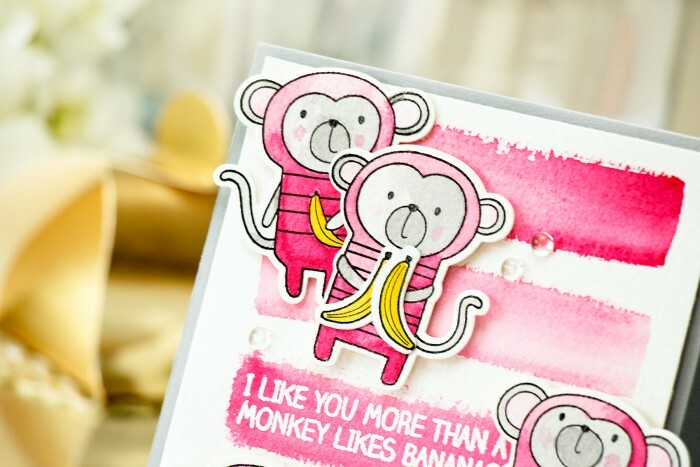 Love your little pink monkeys, such fun! I too like to use Arches Watercolour paper for projects (for real painting too LOL!) It takes the watercolour and inks so much better than cardstock of any sort. What a joy to find your blog! Congrats on being GD at MFT!!! aaaw, thank you! I need to get the hot press paper as well for stamping, as this one has lots of texture. thank you!